The thin-film solar leader is betting its future on a smooth transition to the larger Series 6 cadmium-telluride solar module. First Solar, the leader in thin-film solar, logged a strong Q1, well ahead of expectations on revenue while modestly raising guidance for 2017. Gross margin was below some analyst expectations, though. Credit Suisse wrote in a note: "Pricing still stinks, assets still great." The company has a strong cash position. The vertically integrated solar manufacturer has been going through a restructuring effort in order to cope with the industry's weird year of transition. Last year, First Solar laid off staff, optimized manufacturing and rejiggered its product mix. First Solar is betting its recovery on the success of its new, larger-size Series 6 solar module and just reported its financial and operational results for the first quarter of 2017. The Series 6 holds the promise of lower module costs and lower balance-of-system costs -- but first the company has to seamlessly ramp down its existing production and ramp up the new form factor. It's this new product that will keep First Solar relevant in the face of continued cost reductions from China Inc.'s solar modules. UBS is upgrading First Solar shares after the petition filed last week to target non-U.S. imports of silicon based PV modules. First Solar would be exempted from a minimum pricing scheme if implemented, according to UBS -- which sees this as worth potentially $10 per share. UBS claims, "We see ASPs in the 50-60 cents/w range as quite plausible as a minimum price, and see the Street as largely discounting the possibility." Oppenheimer writes: "We believe such a result would effectively give FSLR a dominant and insulated position in the U.S. market. 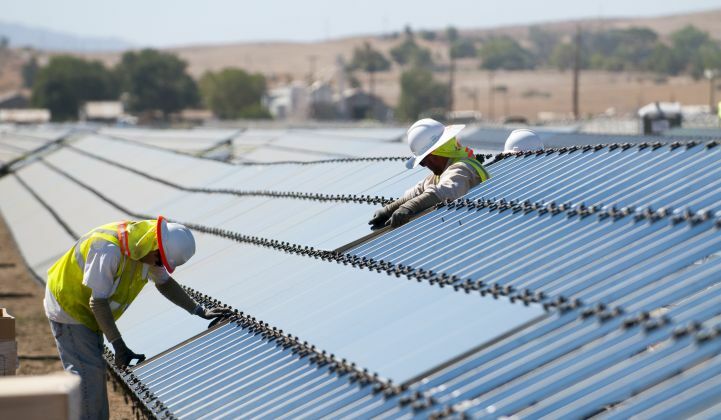 We note that the Solar Energy Industries Association opposes the petition due to risk to 258,000 solar jobs, of which <1 percent are manufacturing-focused." August 2017: International Trade Commission (ITC) issues preliminary decision. October 2017: ITC sends report to the president with suggestions for duties. October-December 2017: President announces any relief actions to be enacted. UBS again: "We believe the latest petition for the imposition of a tariff (on cells) and price floor (on modules) which excludes FSLR products would result in a clear win for FSLR, which could effectively gain all upside in ASPs as margin, whereas others would simply treat a tariff as a pass-through cost. We note passage of the petition would enable several policy goals for the administration, including making coal (comparably) more competitive (by raising the cost of solar), supporting U.S. manufacturing jobs, and maintaining a tougher stance on international trade." According to First Solar, "Series 6 is on track" with series-specific tools ordered for Ohio and Malaysia factories and an anticipated Q3 installation date. The company claims to be working with more than 100 customers and racking firms for its new module. Full ramp of the new product should occur in late 2018. The balance-of-system disadvantage First Solar had with its smaller Series 4 module (compared to crystalline silicon) should be eliminated. First Solar raised guidance for full-year 2017 revenue, operating cash flow, net cash and EPS "based on improved operational performance and increased visibility into upcoming project sales." FSLR raised its revenue guidance from $2.8 billion to $2.9 billion up to $2.85 billion to $2.95 billion, and increased its gross margin guidance to 12.5 percent to 14.5 percent. The company is guiding to 1 gigawatt of production by 2018, fully ramped by Q4. The earnings call confirmed a small boost in conversion efficiency with a fleet average of 16.7 percent and a Series 4 lead line efficiency of 16.9 percent in Q1 2017. Recall that First Solar was shipping 11-percent-efficient modules in 2011. The firm aspires ultimately to reach greater than 18 percent efficiency. First Solar stock is up 17 percent on the quarterly news.